Dexter Gordon the icon is the Dexter beloved and celebrated on albums, on film, and in jazz lore--even in a street named for him in Copenhagen. But this image of the cool jazzman fails to come to terms with the multidimensional man full of humor and wisdom, a figure who struggled to reconcile being both a creative outsider who broke the rules and a comforting insider who was a son, father, husband, and world citizen. This essential book is an attempt to fill in the gaps created by our misperceptions as well as the gaps left by Dexter himself. 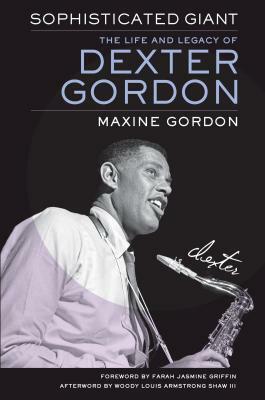 "Maxine Gordon astutely frames the fiery daring of Dexter Gordon’s generation of bebop innovators in the context of rising black consciousness and creative agency in midcentury America…“Sophisticated Giant” is a work of considerable sophistication, the first-person testimony of its subject employed with affectionate discipline, smartly contextualized and augmented by material from interviews Maxine Gordon conducted with the tenor saxophone masters Sonny Rollins and Jimmy Heath, the record producers Bruce Lundvall and Michael Cucsuna, and others." "Throughout the book, Maxine provides rich descriptions of people, places, and events, often quoting from Dexter. Through her meticulous research, new information about him emerges. . . While meticulous about details, the author is also a good storyteller, so, aside from its scholarly discipline, the book is intriguing and leads the reader forward like an absorbing detective novel." “Maxine’s book shows us not only the world Dexter Gordon lived and breathed, but many other musicians we know, don’t know and should know. We see the reality of the Jazz world, the unthinkable hardships and struggles brought together through the common love of music. The book is incredible. Maxine Gordon is incredible. Her passion to share, explore and discuss the reality of the Jazz world is a true inspiration." "Gordon’s life has previously been chronicled, but not with so much of his own achingly personal, brutally honest voice. Sophisticated Giant is not a critical analysis of his music; instead, Maxine has interwoven Dexter’s own letters and poetry with a broad spectrum of anecdotal accounts, plus her own meticulous scholarship and adoring reflections, to craft a vivid life story. . . . This is a must-read for jazz fans." “Dexter Gordon left us almost three decades ago, but his presence in 2018 has virtually brought him back to center stage." "Exceptional. . . . Maxine Gordon believes that 'the story of Dexter's life is nothing less than a cultural history of creative Black Americans in the interwar and postwar years.' In Sophisticated Giant, she's written a book that reflects this important truth." “Sophisticated Giant paints a convincing picture of an extremely charming, intelligent, resilient, and talented man."